Something that confuses most fighters when they first encounter the walking dead is the obvious variation. To the untrained eye it appears that there are different kinds of zombie, that the zombic condition somehow creates different symptoms in some humans and there is some truth in this. In zombiology, we call these zombie ‘types’ as they are in no way variations in any medical definition. They are all humans who have been transformed into ravenous walking corpses by the zombie virus. However, with factors such as climate, injury, age profile and even look, the zombie fighter can find themselves facing a variety of these different zombie types. The Ministry of Zombies recognises seven official types of zombie although there are considerable variations and some types may be combined. Know these types, their attack vectors and how to fight them. Some zombie fighters recognise an eighth zombie type, infected humans, as although they may not have yet developed the symptoms of the zombic condition, they are still a clear danger to any living survivor. Typically these individuals know they’ve been infected but will do anything in their power to hide this fact from fellow survivors. Ironically, they seem drawn to survivor groups and in the short time they have left, will try to work their way into a group. Give a clear warning ‘Stay back or I will use lethal force’. Do not allow them to approach even if they insist they just want to talk. You can always throw out food and supplies if they need it. Depending on the situation, you may fire a warning shot. Do not allow this individual to join your group if they have clear bite marks. If you are not going to quarantine them then they need to be either on their way or you will need to take them down. Keep watching if they choose to walk away. Be wary in case they try to sneak back towards you. This is something virtually every infected survivor will do. They may hide and wait until night before trying to get into your compound. It is a sad fact that few infected humans will walk away from a human settlement. Will display classic zombie signs such as pale grey-blue skin colour. Can appear ‘human-like’ with no visible wound. Others will be in terrible condition, with dry open wounds or unsightly mould patches. Will stagger or ‘run’ at some pace towards any living human. Arms will be reaching forward to grab. Main objective is to cram flesh into mouth. The neck and forearm are the most common bite targets. Identify the zombie (use picture if unsure). This will be an important step early on as trigger-happy survivors open fire on everything and everyone. A heavy blow or shot to the head will do the business – aiming to destroy at least 80% of the brain. Confirm the kill with a foot stamp or club hit. Always check your zombie kills before notching them up on your zombie kill chart. Bulky and over-sized zombies, bloated by the build-up of acid and gas within the corpse. Humid and tropical conditions mean that this excess liquid builds pressure within the zombie, particularly in the stomach and intestines. 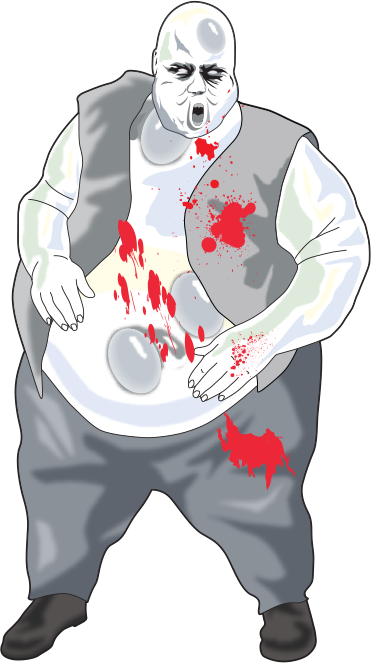 Bloaters can be very dangerous in confined spaces and are prone to block entire corridors. A bloater has the same flesh-feeding instinct as any other zombie. Its bulk makes it a slow opponent and an easy target. If it trips, it can suffocate opponents in folds of putrid and rotting flesh. It is prone to necromesis – the ejecting of stomach acid and bile at velocity. In confined spaces, bloaters will use their lumbering bulk to block escape routes. Never shoot or pierce a bloater at close range. These creatures are full of pressurised bile and infected vomit. They will explode if punctured. Create distance between yourself and a bloater with a strong two handed shove. Alternatively, a double drop kick when it is safe to do so. After creating aforementioned distance (you need at least 3 metres), aim a shot, arrow or spear towards the head of the creature. If you can leave the body then do, but if you need to deflate it then a long hollow pole shoved into the side of the creature will allow the pressure to be released safely. Children are infected with the zombie virus in the same way as adults. The conversion process is slightly faster in children under 16. Kiddie ghouls tend to be faster and more dextrous than the adult zombie due to their growing muscle mass. The right kiddie ghoul can reduce even the most seasoned zombie fighter to inaction. These creatures use that second of uncertainty to race forward at pace. Their zones of attack are all below the belt. Lower body parts are therefore particularly vulnerable. Be prepared for the harrowing sight of a ten-year-old zombie. It’s tragic, but never forget they are the undead and should be destroyed in the same way as adult zombies. Be cautious of kicking these tiny terrors. Even experienced fighters are prone to miss these fast moving creatures, allowing them to sink their teeth into the flesh or kneecap of the defender. If you are armed, take your time as you will typically only get one shot and remember, when under stress shoot low. The idea is to stop the creature. A head shot is hard on kiddie ghouls. If you are unarmed then time your kick as the creature is just about to reach you. Aim it towards the chest to avoid it being knocked over by your kick and into your body.